The elder tree (sambucus nigra) has been prized as a “medicine chest” for centuries because of its versatile applications. Black elderberries (sambuci fructus), the fruit of the elder tree, have been used both to prevent and treat the flu, common colds, coughs, sinus pain, back and leg pain, nerve pain, arthritis, inflammation, chronic fatigue, hay fever and have been shown to help prevent cancer and to significantly reduce the risk of dementia/Alzheimer’s. Elderberries are a natural anti-inflammatory and are particularly high in flavonoids (plant-based antioxidants) – higher than blueberries, cranberries, blackberries and goji berries – and these flavonoids are known to help prevent damage to the body’s cells and boost the immune system. They’re also high in vitamin A and with the exception of rose hips and black currants are thought to have the highest levels of vitamin C.
Numerous studies have shown elderberries to be particularly effective in treating colds and the flu. Below is a summary of just two of them. From Pharmacy Times: “Are there natural ways to protect patients from the cold and influenza viruses? One potential remedy, elderberries, have been used for thousands of years as both medicine and in food….The results of some studies show that elderberries do indeed have significant benefits against cold and influenza symptoms. “In another randomized, double-blind, placebo-controlled study performed in Norway, researchers gave either a placebo syrup or elderberry syrup to patients who reported having flu-like symptoms for less than 48 hours. The results were similar to Dr. Mumcuoglu’s results. On average, the patients who received the elderberry syrup saw relief of symptoms 4 days earlier than the group that received the placebo syrup. As an added benefit, the patients in the elderberry syrup group reported taking significantly fewer over-the-counter medications in hopes of symptom relief. Growing up my mom would regularly brew up natural home remedies when my brother and I had colds and coughs and they always served us well. Elderberry syrup was one of them. While conventional drugs certainly have their place, I’ve always been one who turns to them as a last resort, after I’ve first tried more natural, holistic options. 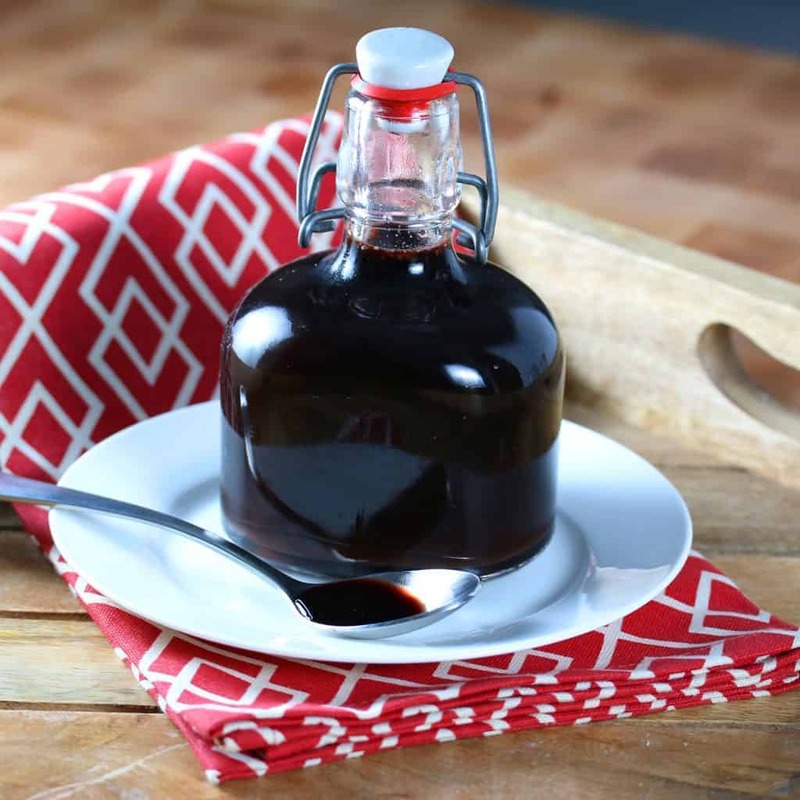 Elderberry syrup is an age-old elixir that has been used for thousands of years for both treating and preventing the illnesses that commonly accompany the cold weather: Coughs, colds, and the mild flu. 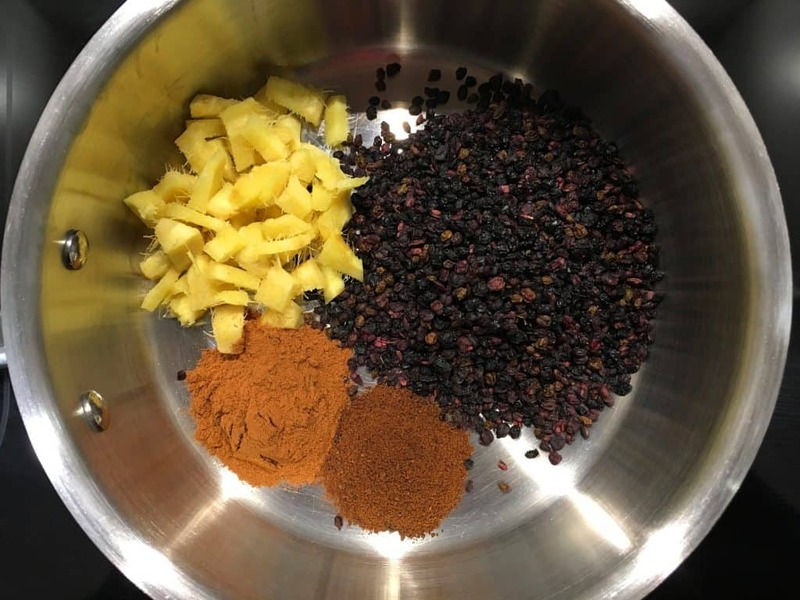 This homemade elderberry syrup also incorporates therapeutic doses of ginger, cinnamon, clove and raw honey for added fighting power and protection. Ginger has been used for centuries to relieve sore throats, alleviate congestion, soothe upset stomachs, and to promote sweating to eliminate toxins in the body. Cinnamon is an antioxidant-rich warming spice that helps fight infections and viruses and boosts the immune system. Cloves are a natural antiseptic and analgesic, which help eliminate and prevent the spread of germs and provide relief for sore throats. Cloves also act as an expectorant, making it easier to cough up phlegm. Raw honey has antimicrobial and antiviral properties that inhibit the growth of microbes and fight bacterial infections as well as inhibit viral activity. It’s also an effective cough suppressant, soothes sore throats and is a natural sleep aid, especially in children. If you can find it, raw buckwheat honey has the highest level of antioxidants. HOW TO TAKE IT: There is no standard dose for elderberry syrup. Adults trying to prevent a cold or flu can take 1 tablespoon 3-4 times a day and increase it to 2 tablespoons 3-4 times a day to treat a cold or flu until the symptoms disappear. Decrease the dose for children. If giving it to children it’s always recommended to first consult your pediatrician. Note: The American Academy of Pediatrics recommends not giving raw honey to infants under 12 months. 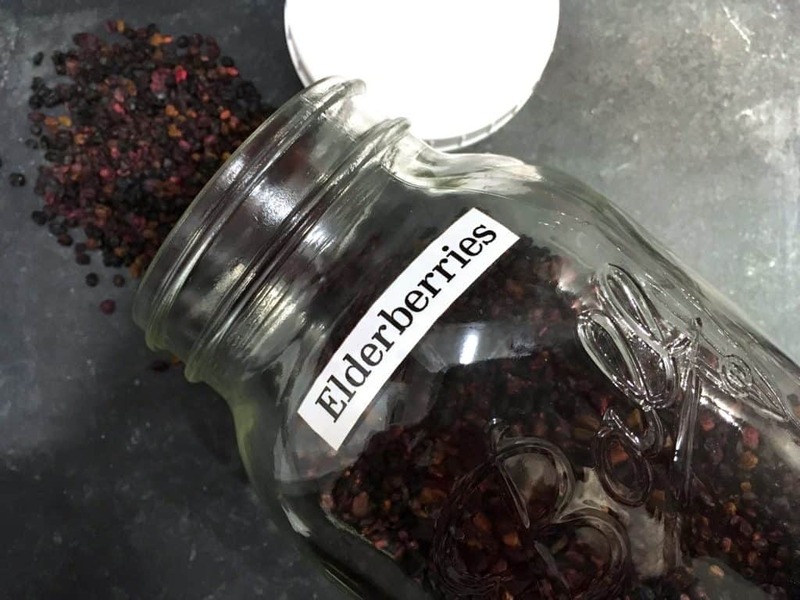 DRIED ELDERBERRIES: The easiest form of elderberries to use for making syrup is dried. 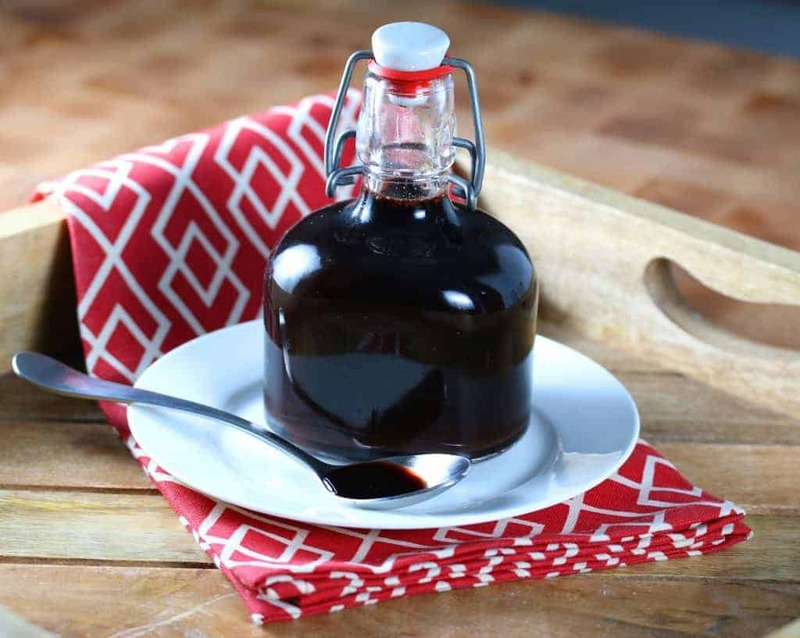 They store well and you can conveniently grab them as needed to make small batches of syrup that will remain fresh and potent before you need to make another batch. I use and recommend Frontier Organic Whole Elderberries. Place the dried elderberries, diced ginger, ground cinnamon and ground cloves in a small saucepan. Add the water and bring to a boil. Reduce the heat to a low simmer and simmer uncovered for approx. 30 minutes or until the liquid is reduced by about half. Use a fork or potato masher to mash the berries. Let the mixture steep for a few minutes and then strain the liquid through a fine sieve or cheesecloth and mash or squeeze the solids to release as much liquid as possible. Let the liquid cool until room temperature (no hotter than lukewarm) and then stir in the honey. Makes about 3 cups. Store in the refrigerator. Will keep for at least 2 weeks. 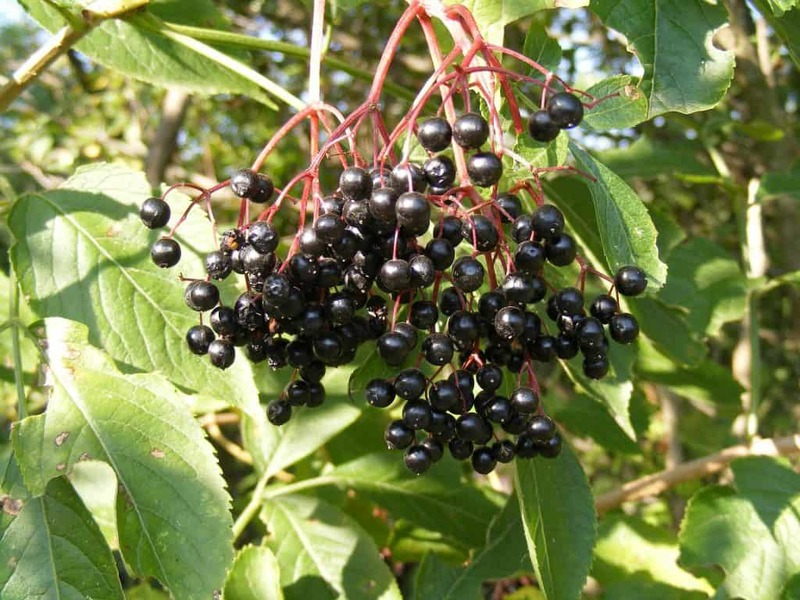 Elderberry syrup has been used for centuries to effectively treat and prevent colds, coughs and mild cases of the flu. It's easy to make and tastes delicious! Place all of the ingredients, except for the honey, in a small saucepan. Bring it to a boil then reduce the heat to a low simmer and simmer uncovered for approx. 30 minutes or until the liquid is reduced by about half. Use a fork or potato masher to mash the berries. Let the mixture steep for a few minutes, the strain the liquid through a fine sieve or cheesecloth and mash or squeeze the solids to release as much liquid as possible. Let the liquid cool until room temperature (no hotter than lukewarm) and then stir in the honey. Makes about 3 cups. There is no standard dose for elderberry syrup. Adults trying to prevent a cold or flu can take 1 tablespoon 3-4 times a day and increase it to 2 tablespoons 3-4 times a day to treat a cold or flu until the symptoms disappear. Decrease the dose for children. If giving to children it's always best to consult your pediatrician. IMPORTANT NOTE: The American Academy of Pediatrics recommends not giving raw honey to infants younger than 12 months. Since this has been one heck of a flu season, I think it’s time to order some dried elderberries! Love this tried and true, family homeopathic recipe!!! Love this! I just ordered the elderberries and will be keeping a ready stash of this in my fridge. Elderberries remind me of my most favorite berry: black currants! I had the flu a couple of weeks ago and now it’s turned into a cold, ugh! I could truly use this right now. Love these remedies so much more than chemical ones! I have been hearing about the benefits of this! Making a list now! I keep hearing so many Moms who swear by this to get through cold and flu season! I’m dealing with a nasty cough after getting over the flu and could sure use this!! So interesting! I have some elderberry capsules that I bought from Whole Foods, but this sounds much more concentrated and tasty! I’d love to make a batch for cough and cold season! This is such a helpful recipe! Cough syrup that actually tastes good? YES!!! Finally! This sounds interesting and useful! I will do some reseach! I usually buy elderberry syrup, but I should try making it next time. Sounds so easy! I have fresh elderberries in my garden- do you think can I use them instead of dried- and if so how much? Hi Christina, I’m not sure what the equivalent measurement is for fresh elderberries. I haven’t had access to fresh ones since I lived in England where they grow wild everywhere and we had some in our backyard, too. We’ve actually just planted several in our yard because I miss them so much! 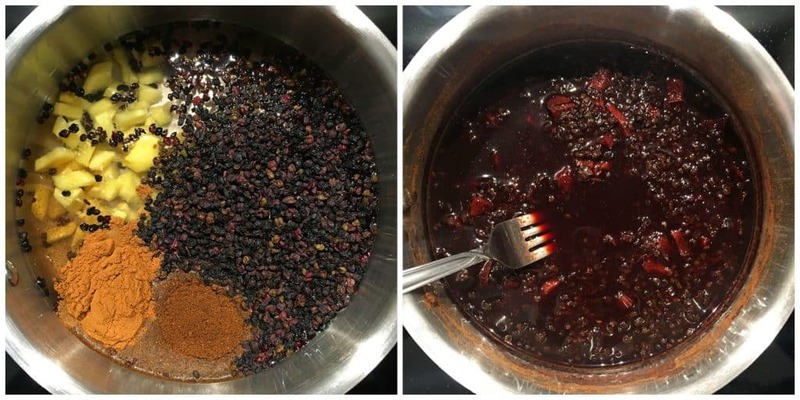 I made this last January, but as I couldn’t find dried elderberries, I used elderberry juice (100% of course) to substitute for half the water amount, and used dried aronia berries. Kept the mixture in the refrigerator and took about a tablespoonful a day. So did it work? Well, all I can say is that my husbnd and son each had a couple of severe colds last winter while I had nothing! I’ll be making it this time with foraged, dried elderberries. Way to go, Becky!! I just made a batch last week to get started for the cold months. My kids practically beg to take the stuff because it tastes so good! :) Thanks for the feedback! I love glass jar in your photograph. I haven’t been able to locate that size. Where did you purchase them? Hi Susan, I’ve had it for a long time and honestly can’t remember where I got it. Sorry I couldn’t point you in a helpful direction. Just making my first batch, waiting for liquid to cool enough to add the honey. It smells SO incredibly good!!! My kids love it so much they actually BEG me for it! 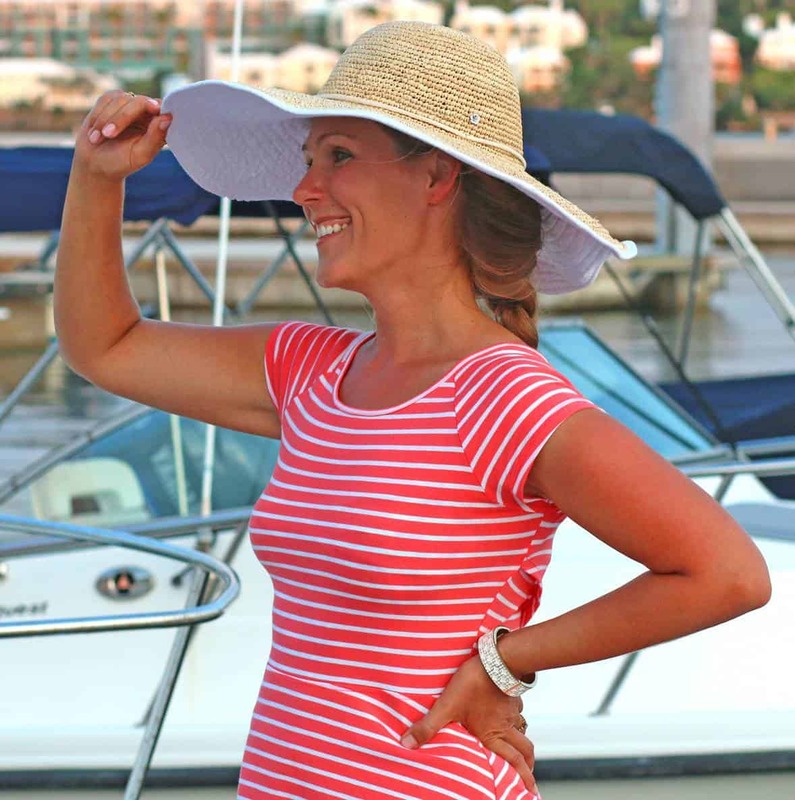 :) I hope you enjoy it, Patsy and, more importantly, I hope you find it’s helpful! Been taking this for several months now with great results. Time to make my own and save some money while keeping myself healthy. On the stove cooking now. Can’t wait. Holy undrinkable cloviness, batman! There is WAY too much cinnamon and clove in this recipe. I couldnt drink it. Even tried more honey. Juat bitter and yucky. Tried another recipe with one teaspoon cinnamon and half teaspoon cloves and it is perfect! Sarah, keep in mind this is medicine, not a drink. The objective here medicinal effectiveness. The cinnamon, clove, ginger and elderberry all have medicinal properties and if you dilute/reduce any one of these you’re also diluting the medicinal dosage. Keep that in mind if what you’re after is something that actually works rather than something that merely tastes good. 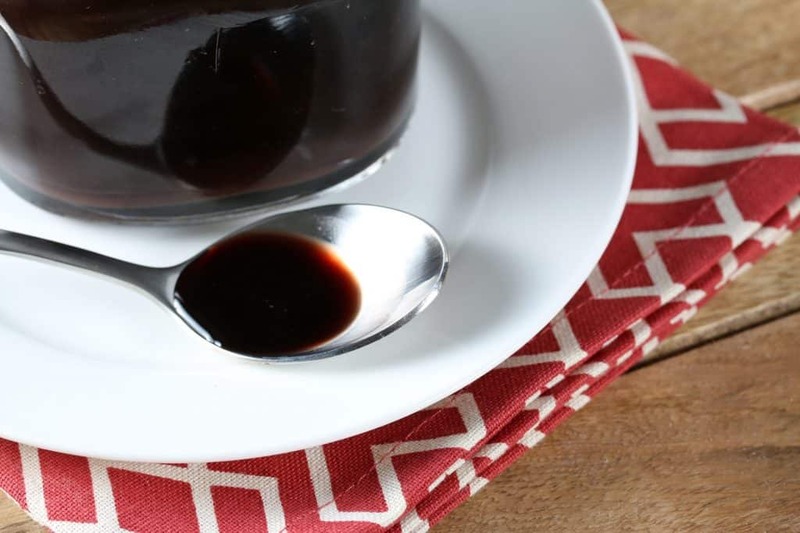 I have tried other recipes as well and most of them, including most store-bought elderberry syrup brands, are so skimpy in their ingredients that you’re getting little more than flavored honey water. I’ve been making this recipe for a year now and it’s hands down the best. My husband and I and are our kids all take it during the cold months to prevent and treat colds and all I can tell you is that it WORKS. Can I freeze the syrup and if so once defrosted how long would I have to use it up? I also don’t want to use raw honey on my children, what would you suggest instead? I’ve put a little local honey and some xylitol to taste. Hi Rebecca, you can freeze it but some research suggests that freezing leads to a decrease in nutrients. The Centers for Disease Control and Prevention and the American Association of Pediatrics only recommend avoiding giving honey to kids under the age of 1. With respect to raw vs. pasteurized honey, according to other research most of the health benefits attributed to honey only apply to raw honey, so if it’s the health benefits you’re after there is very little benefit in using non-raw honey, local or otherwise – in which case you can just use any liquid sweetener of your choice. So ! I made it in double quantity and filled in my different containers and froze it all. I understand what you mean by nutrients getting low but I would rather take it in more quantity than not take it because it went bad. We are a family of three, we used it all up in 4 months. We all take it plentiful everyday. it does taste good. I added a little organic turmeric all while cooking it down. For the anti-viral properties and antioxidants too. the taste was good. Even baby likes it :) I used raw honey that was made in Germany. Slightly expensive but taste was great! Hi Aarti, turmeric is a great addition. I’m not a doctor or certified health professional so I can’t give any official medical advice. But as with any natural remedy, or pharmaceutical for that matter, I would never make the claim that it helps in every situation all the time. On a different note, I don’t know how old your baby is but the pediatric medical board’s recommendation is to avoid giving raw honey to kids under the age of 1, just in case you’re not aware. Hi, just curious…doesn’t heating remove the good stuff from the berries? Would it be better to use fresh? Hi Jon, that’s a great question. Most sources say to avoid eating raw elderberries because they contain anti-nutrient compounds that can cause severe symptoms in the body, including severe nausea and vomiting. These anti-nutrients are deactivated when the elderberries are cooked. 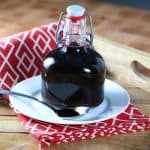 Also, the research that has been done on the effectiveness of elderberry syrup was specifically testing cooked elderberry syrup, so while raw most certainly contains more nutrients and enzymes than cooked, that research indicates that the cooked berries still contain enough to be effective. How many consecutive months can you take elderberry syrup for in prevention (1 tsp per day)? I cannot find any source that says for prevention the duration it can safely be used for. My family started taking it in November 2018 and I was at the end of it mid February 2019 so I started spreading it out to every few days…lo and behold, one got a cold and one now has a sore throat…I am making another batch to get us through March (so that will be 5 consecutive months.). Any insight would be helpful! Hi Cheryl, the purpose of the raw honey is for its medicinal benefits. Otherwise you can simply substitute regular sugar, roughly the same amount in cups. 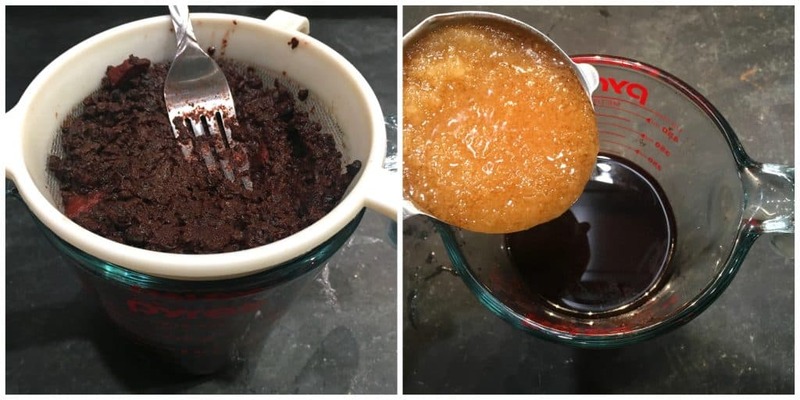 Hi there I have tried this a couple of times and can’t seem to get a thick consistency. Not sure what I’m doing wrong. Any suggestions? No, it won’t have a thick consistency unless you use a thickening agent.